BHOLA, Bangladesh, Jun 22 2016 (IPS) - A continuous influx of sea water is threatening agriculture and food security in vast coastal areas of Bangladesh, but farmers are finding ways to adapt, like cultivating fish and crops at the same time. The coastal and offshore areas of this low-lying, densely populated country include tidal estuaries and river floodplains in the south along the Bay of Bengal. Here the arable land is about 30 percent of the total available in the country. In a recent study, experts observed that salinity intrusion due to reduction of freshwater flow from upstream, salinization of groundwater and fluctuation of soil salinity are major concerns and could seriously hamper country’s food production. According to salinity survey findings, salinity monitoring information, and interpretation of Land and Soil Resource Utilization Guides, about one million hectares, or about 70 percent of cultivated lands of the southern coastal areas of Bangladesh, are affected by various degrees of soil salinity. It is already predicted that if the current trend of climate change continues, rice production could fall by 10 percent and wheat by 30 percent. Dr. Chowdhury explained that salinity in the coastal regions has a direct relation with temperature. If the temperature rises, the soil loses moisture and the salt from tidal or storm surges becomes concentrated, which results in crops wilting or dying – a phenomenon that is is already widely evident. Salinity in Bangladesh, one of the countries worst affected by decades of sea level rise, causes an unfavorable environment that restricts normal crop production throughout the year. The freshly deposited alluviums from upstream in the coastal areas of Bangladesh become saline as it comes in contact with the sea water and continues to be inundated during high tides and ingress of sea water through creeks. A study found that the affected area increased from 8,330 square km in 1973 to 10,560 square km in 2009, according to the Soil Resource Development Institute in 2010. Despite efforts to increase resilience, climate challenges continue to result in large economic losses, retarding economic growth and slowing progress in reducing poverty. To confront the challenges, farming communities in the coastal areas that always relied on traditional agricultural practices are now shifting to research-based farming technology that promises better and safer food production. Recognizing the adaptation strategies, BARI, blessed with years of research, has successfully introduced best farming practices in coastal regions. One is called the Sarjan model and is now very popular. A leading NGO in Bangladesh, the Coastal Association for Social Transformation Trust (COAST), which has over 35 years of experience working mostly in coastal areas, has played a key role in supporting farmers with adaptive measures. 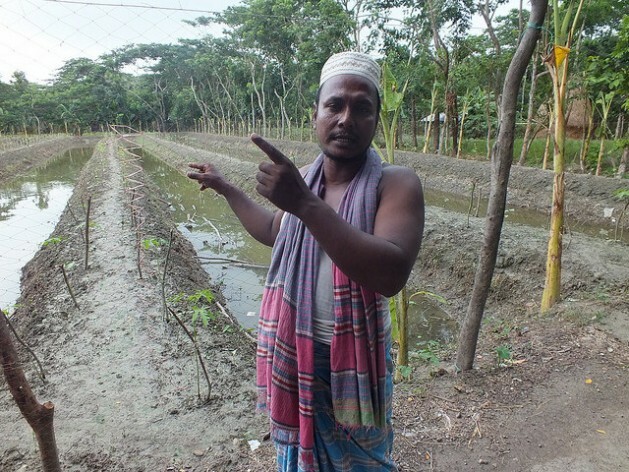 During a recent visit to an island district of Bhola, this correspondent witnessed how COAST in collaboration with the local agriculture department has introduced the farming model that is making huge positive impacts. The Coastal Integrated Technology Extension Programme (CITEP) being implemented by COAST in Char Fasson has been helping farmers since 2003 with alternative farming practices to improve crop production in the face of climate change. As part of its capacity-building programmes, CITEP encourages farmers to use the Sarjan model of long raised rows of soil about one metre wide and 90 cm high for cultivating varieties of vegetables. The trenches between the rows are filled with water into which various types of fish are released for maturing. The water for irrigating the plants comes from nearby lakes filled with freshwater drawn from the Meghna River. The advantage of using Sarjan model is that it protects cropland from inundation during storm surges, tidal waves and flash flooding and avoids high salinity. The new farming practice has turned out to be very popular in Char Fasson, where over 9,000 farmers are now using the model. Many farmers have also formed self-help groups where members benefit from sharing each others’ experiences. Losses of crops on flat lands are disastrous. Mohammad Joynal recalls how tidal waves three years ago destroyed huge crops. “We were helpless when the crops were inundated on about 5,500 hectares of flat land. The sea water inundation for four months caused all crops to wilt and eventually rot,” said a dishearten face of Joynal. Hundreds of farmers have been trained using demonstration crop fields on the adaptation techniques. “We have many different models developed to grow crops at different levels of salinity which are already proven successes,” said BARI Director General Dr. Mondol. Sea level rise is already evident in coastal Bangladesh. Projections show that 97 percent of coastal areas and over 40 million people living in coastal Bangladesh are vulnerable to multiple climate change hazards. Globally, emissions of carbon dioxide and chlorofluorocarbons into the atmosphere are growing at a rate of 5 percent annually, according to a joint publication by COAST and the Equity and Justice Working Group (EJWG) on ‘Climate Change Impact and Disaster Vulnerabilities in the Coastal Areas of Bangladesh’.